Simple module that can be used for pulse/direction or +-10V analogue control with encoder output for external master controller that close the loop. The analog input can also be used in open loop to control position, velocity and torque. Additional it has RS232 and RS485 for access to PC or PLC for programming or setup. The module contains electronics so the 5V serial signals from the basic motor is translated to RS232 or RS485. It is possible to use both RS232 and RS485 but not at the same time. 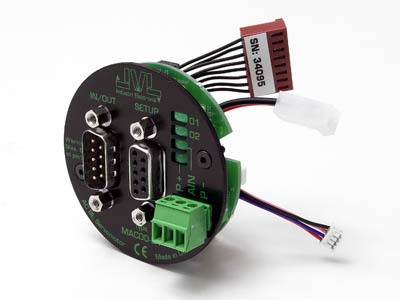 The RS232 is typical used when commissioning software MacTalk is used to setup or monitor the motor. RS485 is used for industrial communication to PLC or PC that transfer operation data to the motor. You can connect up to 32 motors in parallel on the RS485, and up to 7 motors in parallel on the RS232.